Widdershins is a renowned thief who has her own personal god named Olgun. Olgun lives inside Widdershins (or Shins, as she is known by her friends). He lends Shins portions of his limited powers, and these loans allow her to perform tasks that would be far beyond a mundane person. Shins has decided to return to her home city after spending an adventure-filled year away. They say you can never go home, and, sadly for Shins, this is true. Not only must she find a way to make amends with her friends, but also it turns out that her nemesis Lisette is back in town and she brought some heavies with her—the kinds of heavies that have the ability to cause supernatural harm. To top all this off, something strange has put the city into a siege mentality. Now Shins and Olgun must mend fences, face Lisette, and figure out what plagues Shin’s hometown. Ari Marmell and the iconic Widdershins are back, and they are both at the top of their games. Marmell had me from the first novel of his that I ever read. I had used several of the products he wrote for Dungeons & Dragons, but it was from his novels that I finally learned how talented he really is. No, he is not the second coming, but he is a damn good author. Widdershins as a character really is proof of Marmell’s depth of talent. I have two teenaged daughters, and let me tell you, Marmell has teenaged girls down pat. Shins is a teenager who is on the cusp of becoming an adult at the beginning of this novel. Watching her develop as a character has been one of the many treats in this series. Spoiler alert: This is the last book in the Widdershins cycle. The title is not a misnomer. Now, I won’t go any further and ruin the ending. Back to the review: I received an advanced reading copy, and I hope that they stick with this cover design. It is simple, elegant, and interesting enough that it would have gotten my attention if I had seen it on a bookstore shelf. Other than the great cover art, there is nothing else about the physical properties of this book that stand out. The thickness of both the cover and pages is exactly what you’d expect. Even for an advance reading copy, I saw few if any typos or grammatical errors. This lack of problems bodes well for the final release copy. 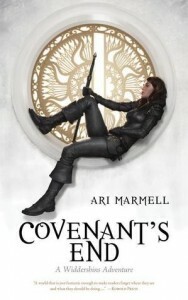 Having read and reviewed the book preceding this one, I had high expectations, and Marmell did not disappoint! A very subtle thing that Marmell did that showed his skills was his ability to have Shins avoid cussing. Some of the alternative words and phrases that she used throughout the book conveyed the idea without needing to cuss. Yes, other characters in the book cussed, but in the midst of everything that happened in this story, Shins didn’t really cuss. I’m fine with cussing, but it is so much better when an author can do it without having to actually do it and when they do decide to actually cuss it sounds like a chorus of naughty angels. As I noted above, this is definitely the final chapter in Shins’s coming of age story. Shins as an angsty teen was something that really appealed to me. Seeing her turn into a woman was a real treat—the transition isn’t really abrupt but her decision-making process is much better developed in Covenant’s End. Marmell crafted some very defining moments where Shins really had to make adult decisions. None of these moments felt like an after-school special, but as a reader I could feel the wheels turning in her head and, when the big revelations hit her, I felt like they hit me as well. As a reader, you can quickly pick up on what is leading up to the adult moments, but the way that Marmell sets the situations up, they become very special. As special as those growing moments are in this book, the action scenes in this book can best be described as in 3-D. With the augmentation from her god, Shins can move in ways that defy the laws of physics. There were a few scenes where the movie The Matrix came to mind. The fact that I’m comparing parts of this book to a movie should tell you that with Marmell’s skillful pen I could “see” the action. The tactics that Shin used during many of these 3-D fights were in line with her personality. She actually tried to avoid unnecessary killing and felt remorse for most of the people she had to kill. There were points where she had to rationalize killing the people that she did kill or injure, and as humans that is exactly what we must do to deal with hurting or killing someone else. Marmell captured some of the emotions and consequences that are associated with violence without stepping up to a pulpit. If you haven’t figured it out yet, I really enjoyed this book. It was smartly written as both an action story and as a coming of age story. This was the best possible way Marmell could have ended this series. His notes to readers at the end of the book were honest and heartfelt, and they proved that he writes what he wants but always keeps his readers in his heart. Marmell is ending this series or cycle or whatever you want to call it while it is at the top of its game. In fact, I imagined I could feel Marmell’s tears running down his cheeks when he wrote the last chapter in this book. As a reader, what more can I ask for? What are the other books in the series leading up to this?